Very interesting article from the BBC on how the Police in Sofia, Bulgaria use luxury sports cars like porches seized from criminals as official cars . In rural Bulgaria it's pretty common to see a farmer making his way to his fields in a cart pulled by a single old nag. The police in the capital, Sofia, can rely on a little more horsepower. It's the only place I've ever seen the police drive a Porsche convertible. Complete with blue flashing light and repainted in white with smart blue stripes. This is not profligacy with public money but something odder. Like the BMW and Merc driven by the Bulgarian police, it's been stolen somewhere in Europe, shipped to Bulgaria by criminal gangs, and then confiscated. So far they've been luckier than one judge, who was proudly going to work in a top-of-the-range four-wheel-drive until its German owner spotted it and demanded it back. 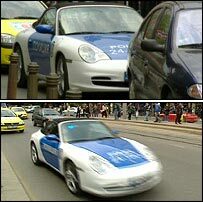 So if this is your long-lost car do contact the Bulgarian police. I'm sure they'll be delighted to hear from you.